I’ve been learning some new post-processing techniques this week – using old images that I’ve taken over the last five years since I got my first serious digital camera. This is one of those – shot a couple of years ago from Sausalito looking toward San Francisco. One of the techniques I’ve enjoyed experimenting with is the Pixel Bender plugin for Photoshop CS5 from Adobe Labs. This image was ultimately processed using the Pixel Bender OilPaint filter – after going through several other filters first. First, the image was opened in Photoshop and adjusted using Nik’s Color Efex Pro 2 and Viveza before importing into OilPaint. After tweaking the OilPaint filter, a bit of additional Tonal Contrast was applied again from Color Efex 2. 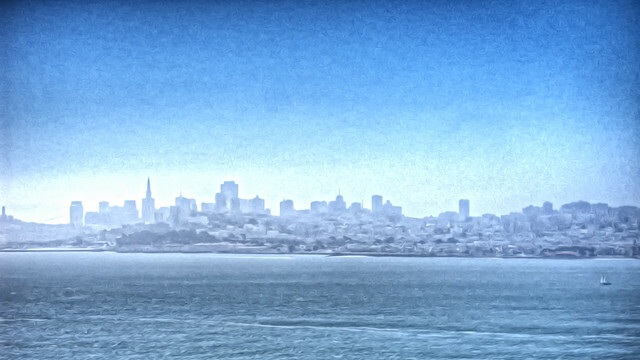 I really enjoy how this skyline of San Francisco turned out – and hope you do too!